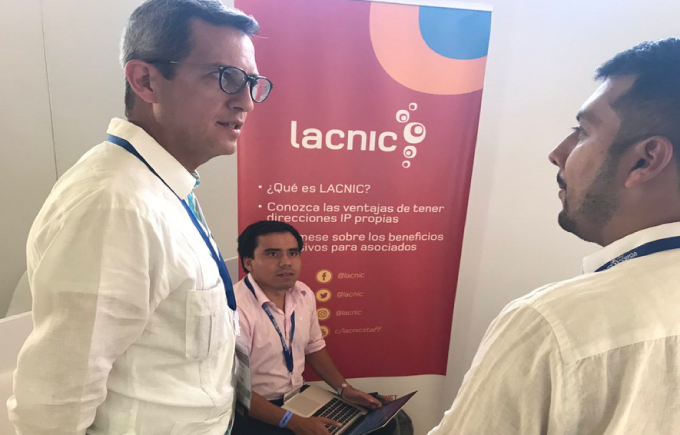 The presence of LACNIC representatives and the booth set up by Regional Internet Registry generated strong interest during the latest edition of Andina Link, an international telecommunications and technology trade fair. The event brought together 1,700 participants representing the ICT industry in 34 countries to the meeting held in Cartagena de Indias, Colombia. LACNIC CEO Oscar Robles was one of the speakers at Andina Link, both during the opening ceremony and as part of the panel on The Challenges of Regulatory Modernization in Latin America. There, Robles stressed that, considering the characteristics and challenges faced in each Latin American and Caribbean country, “it’s better to deregulate rather than to regulate.” “It’s time to think that the model has changed,” said Robles. LACNIC’s CEO noted that LACNIC makes IP resources available to content providers to address the convergence of services. This panel discussed the importance of modernizing the legislation on ICTs in Latin America and the Caribbean, and whether it should include strategies to promote the digital market and industry. Andina Link has positioned itself as a meeting place for the telecommunications industry in Latin America and is attended by a significant number of ISPs from around the region. The LACNIC booth became an attraction for the visitors of Andina Link. Rodrigo Zambrana, Resource Analyst at LACNIC, was there to offer information and answer questions. ISP representatives took advantage of the opportunity to discuss their concerns and enquire about the operation of the regional Internet Addresses Registry and how organizations can have direct access to address blocks. “We were surprised by the number of organizations that came by to enquire, particularly because they were trying to obtain IPv4 addresses,” noted Alejandro Acosta, R+D Coordinator at LACNIC, who was also part of the panels on TELCOS and Content Providers and How LACNIC Manages WISP IP Addresses? Questions on resource requests focused on real-life problems of smaller ISPs that are not members of LACNIC and have difficulties in obtaining addresses.